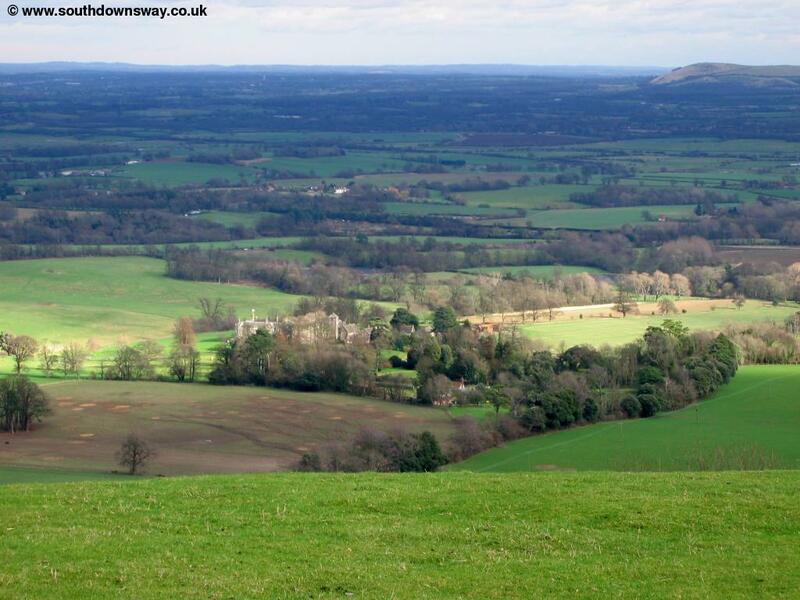 This walk starts from the village of Washington and climbs back onto the downs, passing Chanctonbury Ring and Steyning Ring. 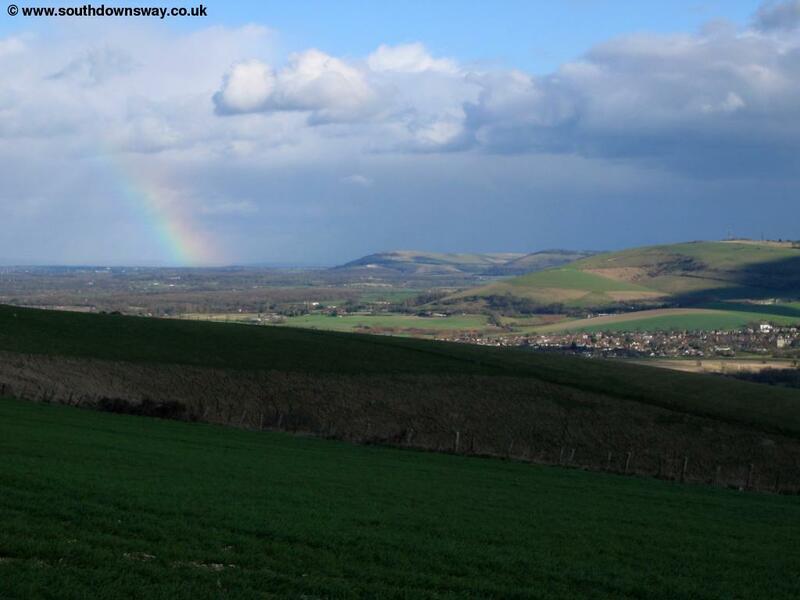 Soon you have fantastic views over Steyning to the North and the coast near Shoreham-on-Sea to the south. Soon the path descends from the downs to the banks of the River Adur then following the river into Upper Beeding. 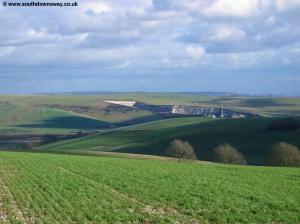 Washington is just off the A24 (London - Worthing Road), approximatly 10 miles from Worthing and 15 miles from Horsham. At the junction with the A283 turn onto the A283 towards Steyning then almost immediatly turn right when signed for Washington Village. 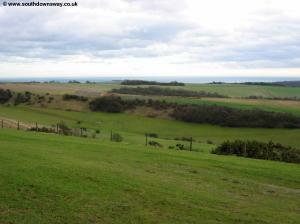 There is a layby opposite the pub and also a small car park next to it. By public transport there are three bus routes serving Washington. The first, Stagecoach South service 1 runs hourly (Monday - Saturday) to Washingtom from Worthing, Storrington, Pulborough, Petworth and Midhurst. 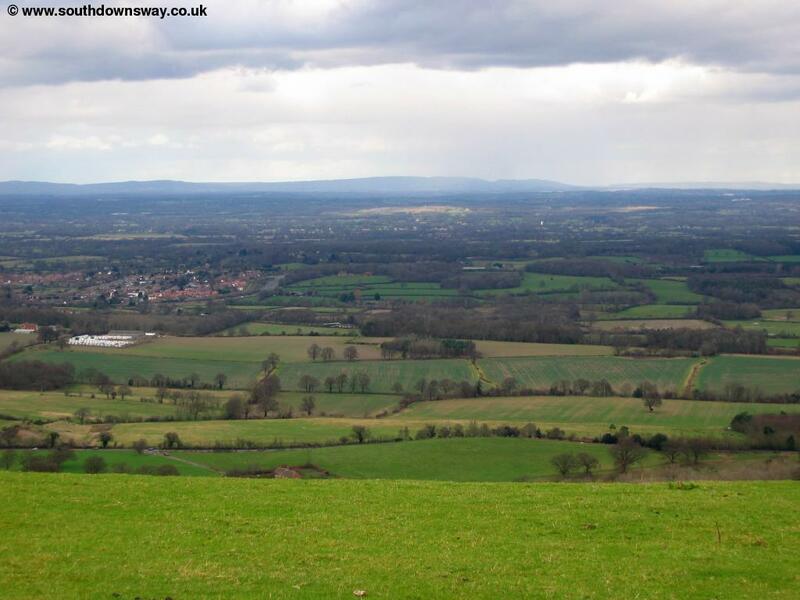 Compass Bus route 100 runs hourly (Monday - Saturday) from Pulborough, Storrington, Steyning, Albourne and Burgess Hill to Washington. Metrobus route 23 runs approximatly once every 2 hours 7 days a week from Crawley, Faygate, Horsham, Southwater and Worthing to Washington. Note that route 23 is operated by Stagecoach South on Sundays. 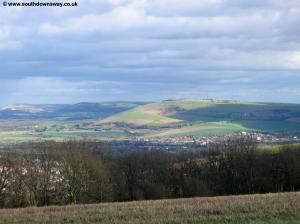 There are rail stations at Worthing, Burgess Hill, Horsham and Pulborough. 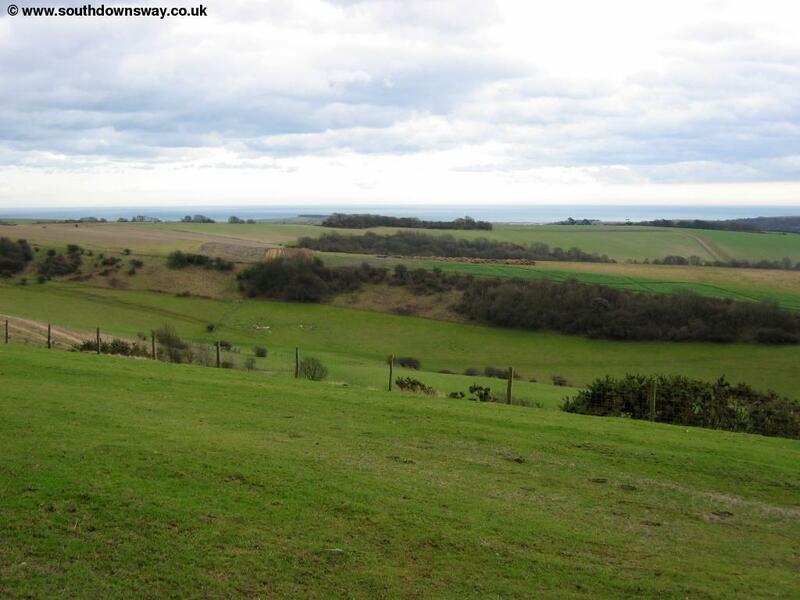 From the centre of Washington head south, away from the A283 passing the pub on the right then continue away from the village, then take the lane on the left which soon begins to climb past a couple of cottages. Follow the signs here as the path continues to climb. Soon you get to a small junction where there is the entrance to the quarry. Continue until you get to the car park just off the A24, then turn left up the hill to the left of the car park, beginning the climb onto the downs. At the junction continue straight on as the path becomes chalky. 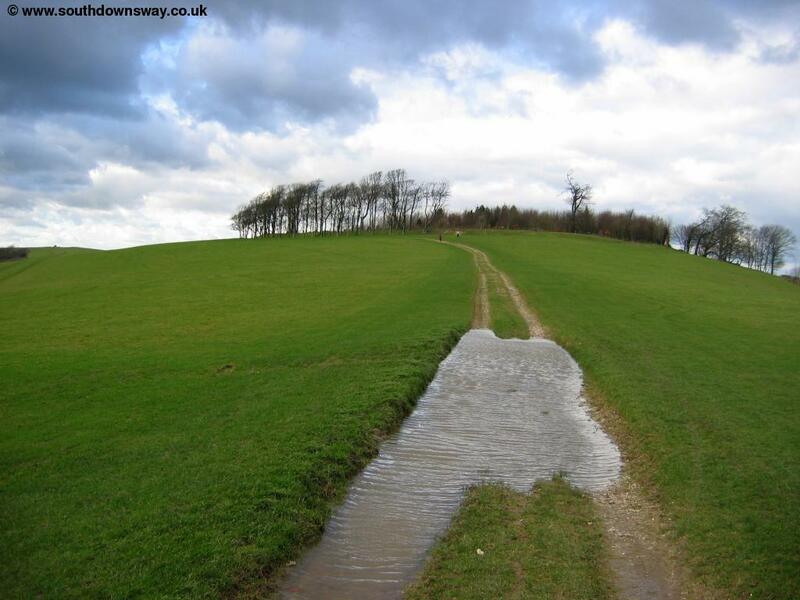 Soon the path splits into two, with cyclists and horse riders going striaght on whilst walkers turn slightly to the right, past some odd shaped hills on the left and up to Canctonbury Hill. As you near the top of the downs you see the coast to the south towards Worthing. 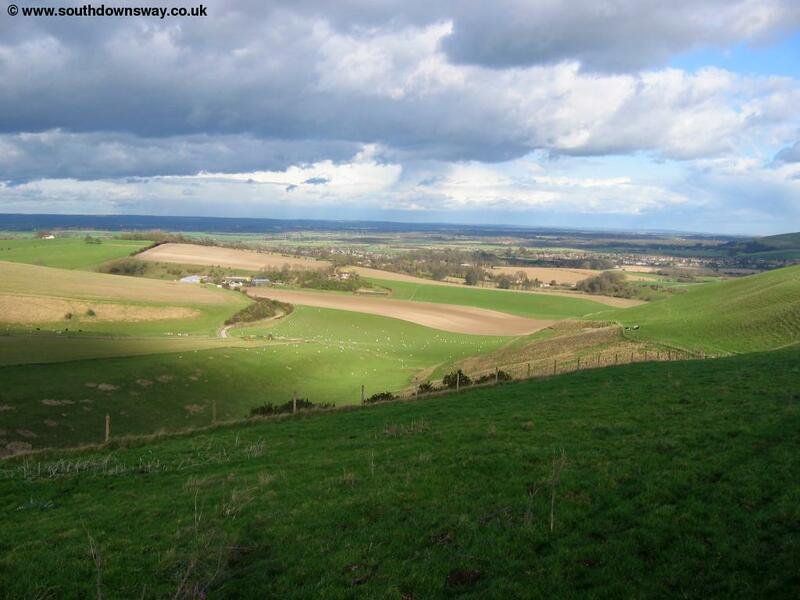 Soon the footpath reaches a junction of paths where you turn left and soon rejoin the bridleway. 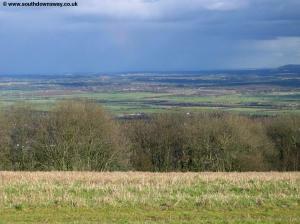 Soon you can see the top of Chanctonbury ring ahead with it's distinctive clump of trees battling against the wind. 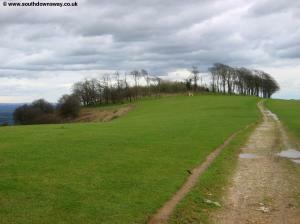 From Chanctonbury Ring the path turns slightly to the right and descends slightly from the top of the hill. Soon yoiu come to another junction of paths where you follow the clear signs slightly to the left, past the trees called Lion's Bank. 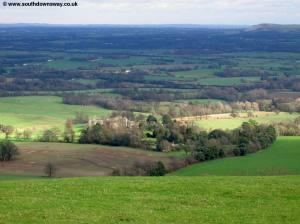 Below you can see Wiston House and the small hamlet around it. 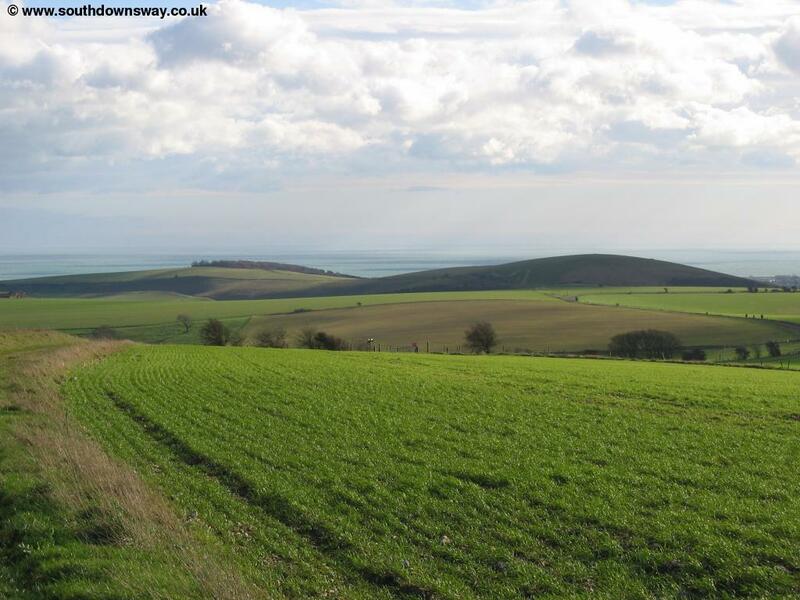 As the path continues to descend from Chanctonbury Ring you get stunning views in all directions including over the coast and to the north. 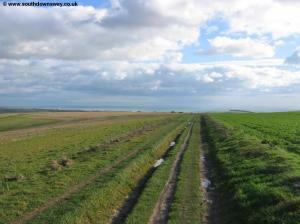 The path continues to turn to the right and starts to head south, so it looks as if you're heading right for the coast. 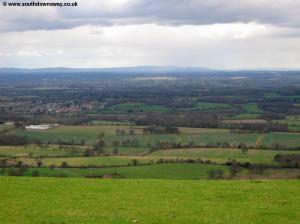 To the left you can see Steyning below and the South Downs Way beyond. 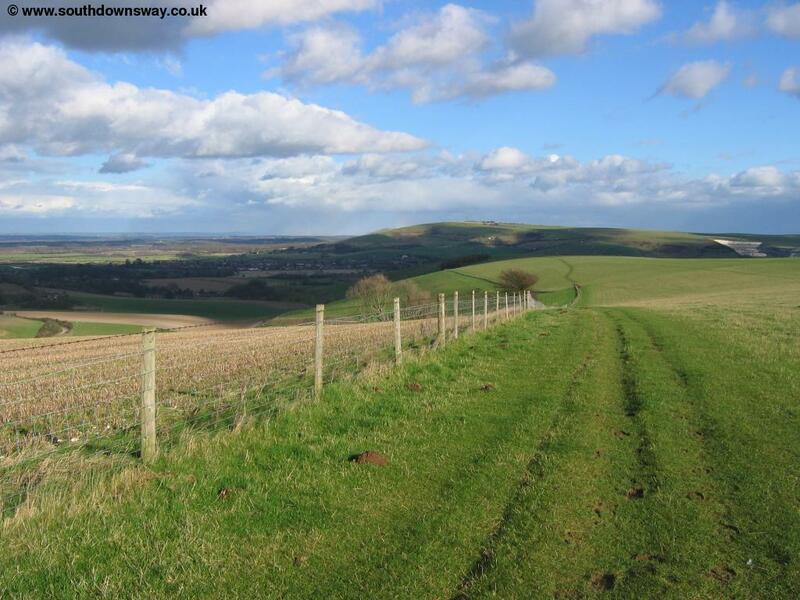 Soon the path appears to join the road near Steyning Bowl, but fortunatly there is a path to the left of the road, so you don't need to watch for traffic. 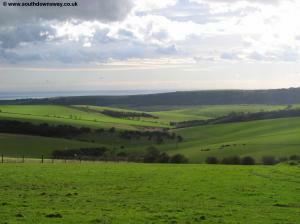 Here the stunning views of the coast and of Steyning continue. 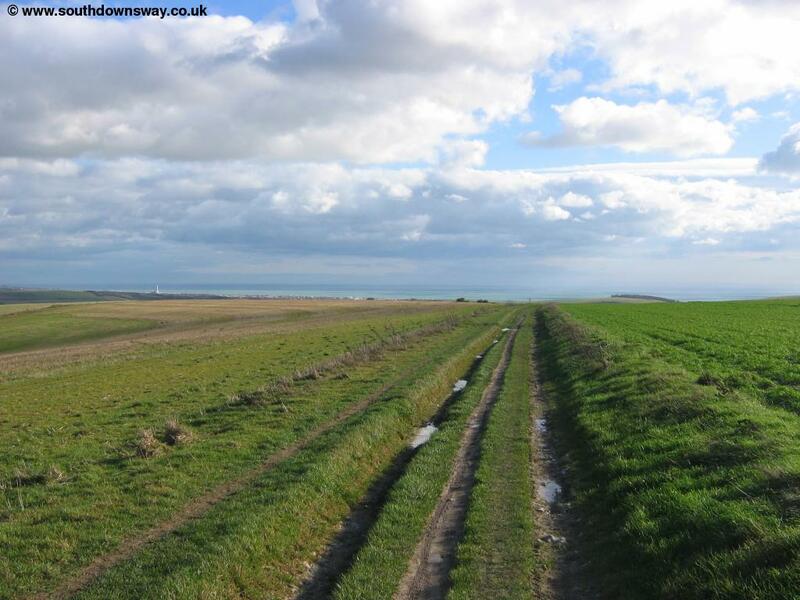 Looking East however you can see the old quarry of the downs, now beside the river Adur leaving quite a mark on the landscape. 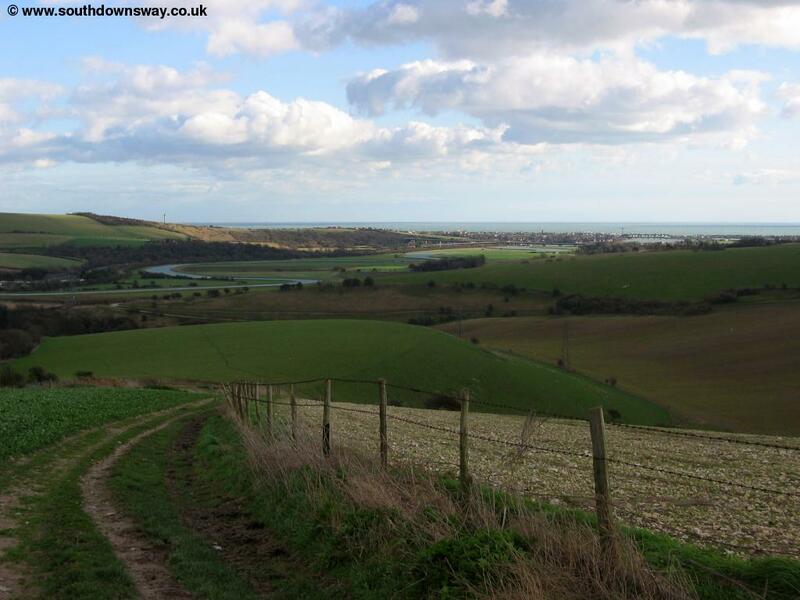 Just before the road begins to turn to the right the path turns to the left, away from the road, and heading towards the river Adur below. 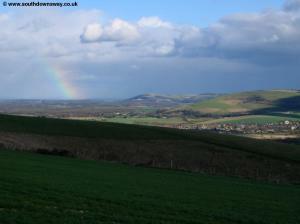 As I walked this part of the path a rainbow formed over the fields to the north. 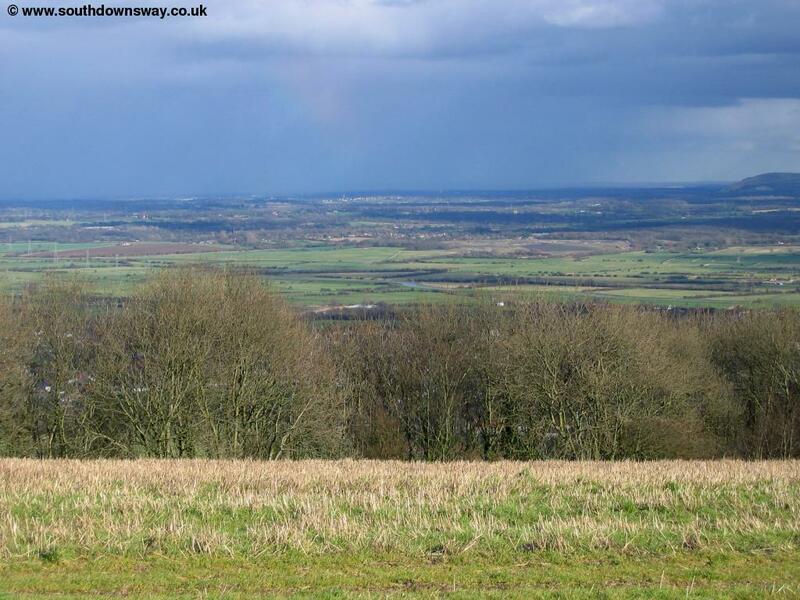 The path is now gradually descending towards the river valley below and soon begins to turn slightly to the right, so enjoy the last views of the surrounding countryside. 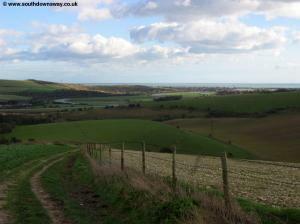 Ahead now you'll see the winding valley of the river Adur, making it's way down to Shoreham harbour at the coast. 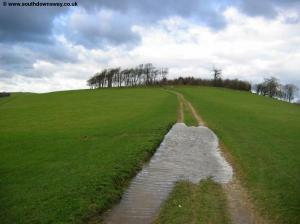 As you get nearer the bottom the path turns left and heads towards the road - where you come to a junction, turn right. This road appears from the map to be quite a minor road, yet it seems very busy and visibility of the oncoming traffic is often poor, so take care here. Here the road is heading through the small village of Botolphs, passing Annington Farm. Here you'll find a welcome drinking tap. Soon you reach the banks of the river Adur where there is a bridge. 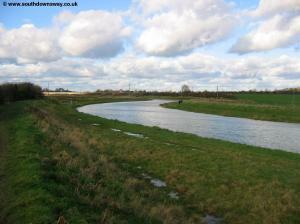 To get to Upper Beeding, turn left when you get to the river and follow the path beside it. 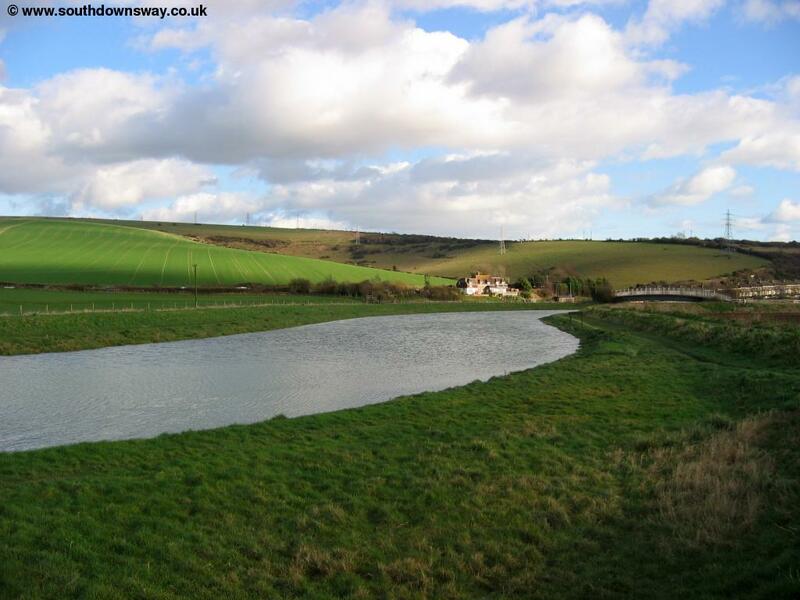 There is a path on both sides of the river, so you have a choice of banks, but the only bridge you can use before Upper Beeding is here, so this is the place to decide. The walk beside the river is very pleasant, although you do get the noise of the A283 as it pases above on a concrete bridge. 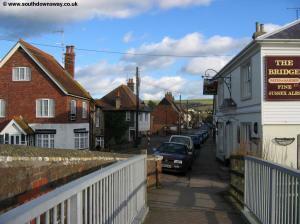 On the right you'll begin to see the houses (and pubs) of Upper Beeding. 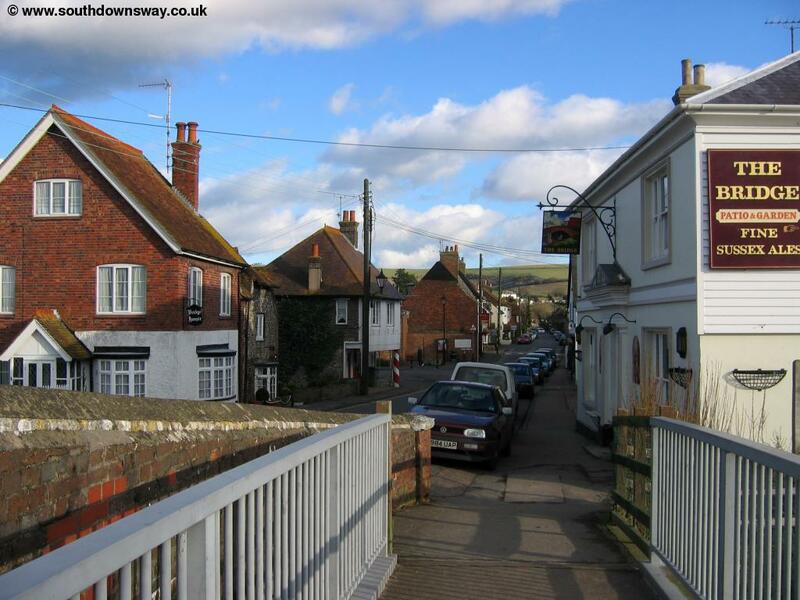 When you get to the smaller bridge of the town, you climb up onto the bridge and turn right into the High Street of Upper Beeding, beside The Bridge pub. Getting back to Washington is easy. 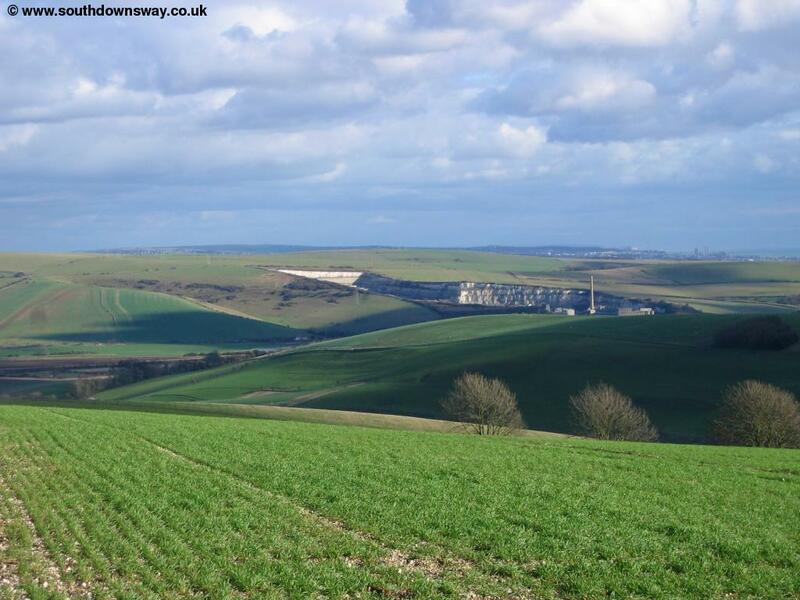 Buses depart from Upper Beeding High Street (the bus stop is next to the Kings Head pub) to Washington hourly (Monday - Saturday) and once every two hours on Sundays. This is Compass Bus route 100. This bus service also serves Pulborough station for trains to the south coast and London via Horsham, Gatwick Airport and Croyden. 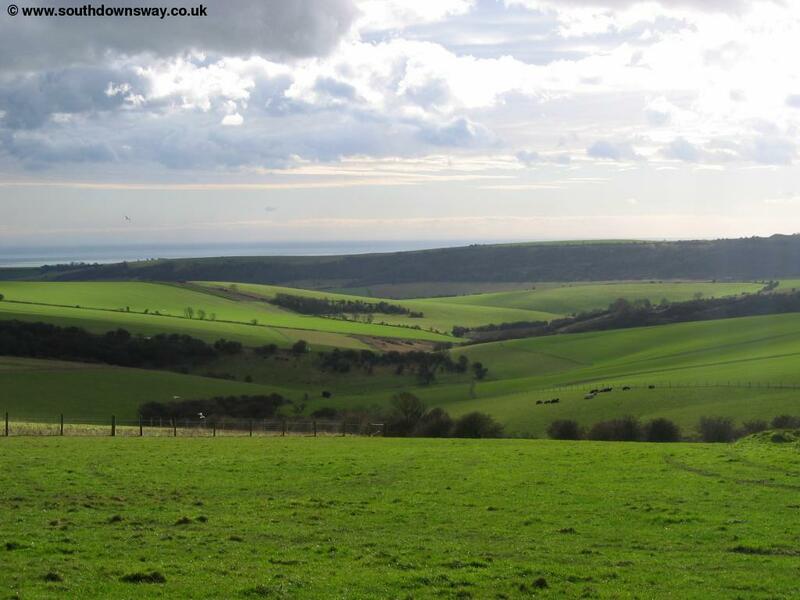 Brighton and Hove buses route 2A also runs hourly from Upper Beeding to Hove, Portslade, Rottingdon, Shoreham-by-Sea, Bramber and Steyning.